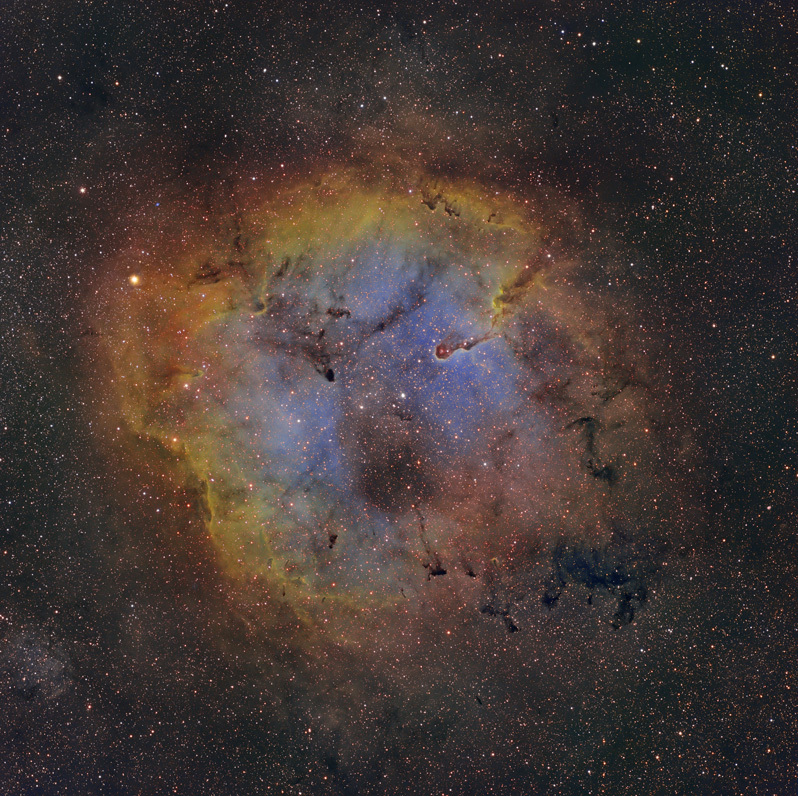 IC1396 is a large emission nebula in Cepheus. The above image is processed using the Hubble Palette (SII, HII, OIII in red, green, and blue respectively) with data acquired over a total of 26 hours, also using RGB to provide more realistic star colors. The corresponding RGB image may be found here. Sulfur, hydrogen, and oxygen present in this nebula are ionized as a result of UV irradiation from the central star HD206267. Radiation from this star has cleared out a central portion from the nebula and has also blown away gas and dust radially, resulting in a variety of dark globules that roughly point towards the center. These are called "cometary globules" in recognition of their overall shape, which consists of a head followed by a tail of dust that is being blown backwards by HD206267's solar wind. The most conspicuous globule is 1396A, also known as the "Elephant Trunk," which contains a subtle reflection nebula vdb142. Other cometary globules can be appreciated in the full frame version of this image. Although the dark gas and dust are opaque to visible light, infrared light passes through this region easily, permitting a view of the inner workings of the Elephant Trunk. Please click here for an infrared view of this area taken through the Space InfraRed Telescope Facility (SIRTF), now known as the Spitzer Space Telescope. Please be sure to check out the larger sized images for greater detail. Rob Gendler has an excellent description of IC1396 on his website. Exposures: Ha, 6 hours; OIII, 5 hours; SII, 6 hours; R, 3 hours; G, 3 hours; B, 3 hours, all unbinned. Total exposure 26 hours. Post-processing: Calibrated in Maxim, aligned and stacked using DeepSkyStacker, followed by DDP in ImagesPlus (IP). Further processing in Photoshop CS (16 bit format) using the clipped layer mask method originally described by Travis Rector. Star colors obtained from RGB data.